One year certainly is a long time! A year ago, Leicester looked nearly unbeatable. They stunned the whole footballing world by winning the title, defying all odds. Last season, they lost just 3 of their 38 League games. It is really surprising to see the same team struggling so bad in their title defence campaign. Leicester City faced Ronald Koeman’s Everton at King Power Stadium on the Boxing Day and lost the game 0-2. With this loss, the Foxes have lost 9 out of their 18 Premier League games this season already. King Power used to be a fortress last season. Such a terrible run of form at home is far from acceptable and Ranieri’s concerns will now be much deeper. 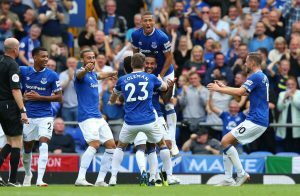 Kevin Mirallas opened the scoring for the Toffees very early in the second half and Romelu Lukaku killed the game later on in the closing stages. For most parts of the game, neither team was threatening. It was a dull game and far from what you expect to witness on the Boxing Day. Here are the Leicester City player ratings from the game. Could hardly be blamed for either goal. Came off his line on occasions. Tried to pick up his teammates with long distribution. Was not particularly a threat attacking wise. Defended his flank quite well. Mustered a brilliant cross for the Ulloa chance. Unlucky to have deflected Mirallas’ shot for Everton’s opener. Never looked confident. His defensive partner was the guilty party for the first goal but it was not his fault wholly. But Morgan’s defensive calibre will come under scrutiny after seeing how easily Lukaku outmuscled him for the second Everton goal. Made his Premier League debut and had an excellent game to announce himself. Was a constant threat attacking wise. Defensively, he was quite solid too. Looked lively and the crowd certainly did not like the decision to sub him off. Tried his best to help his side create chances. Not anything special. Sometimes won his midfield tussles and sometimes lost. Average! Better from his showing in the last few games, though. Offered plenty of industry and running but his final ball was horrible. Was subbed off at half-time as Ranieri changed his formation. Was decent in the first half, though. Never really looked threatening. Didn’t get the support. Was hardly visible. Silly booking. Everton Retain Interest In Versatile FC Porto Defender: Just What The Toffees Need? Everton Planning To Sell 24 Y/O Defender: Three PL Clubs Who Can Make Use Of His Talents! Everton Show Interest In Manchester United Outcast: Can Mourinho Afford To Lose Him Already?